If you read any of my books, please go to Amazon and write me a review. It is a great help to an author to get the feedback from her readers 🙂 Happy Reading! Sunset is the first book in the Peakview Series. Breakfast for Two is the second book in the Peakview Series. Colorado Cabin in the Pines is the third book in the Peakview series. LUKE WALKER loves his childhood home on the Walker Horse Ranch. Now he is building his own cabin on a hillside overlooking the entire spread. He’s avoided romance ever since his high school girlfriend left four years ago, taking his heart with her. PENNY ANDERSON couldn’t wait to get out of isolated Peakview, Colorado where she was born and raised. At college in Chicago, she found her true passion in working with underprivileged children. MELANIE GENTRY has found her father and a home for herself and her teenage daughter in the small mountain town of Peakview, Colorado, but is that enough? When she meets a handsome, mysterious cowboy she begins to wonder if she can find even more. HANK DALTON is a loner. He is content to live in a small one room apartment over the saddle barn at Peaktop Guest Ranch where he’s a wrangler. He’s avoided entanglements with women for over twenty years, preferring the company of horses. He’s not looking for romance. But there’s something about Peakview’s newest resident, Melanie that makes him want to reconsider. Can these two lonely people, both haunted by past mistakes, find love in the Colorado mountains? When their paths cross, Cynthia begins to question her life in Chicago, and AJ struggles to find a way to keep her in Colorado. Can the spirit of Christmas bring these two people from very different worlds together and help them find their way to true love? 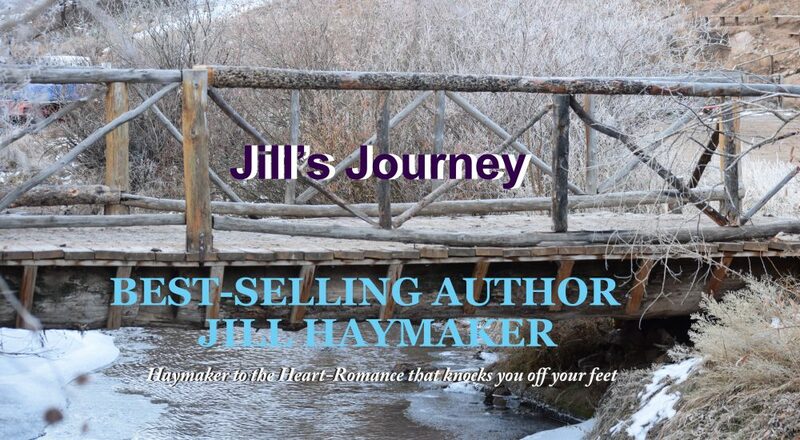 Jill Haymaker brings you back to picturesque Peakview, Colorado in this small town western romance. Sam Phillips has given up on love since the death of his wife. With only his small dog, Marshall, for company, he’s content to live out his life alone. That is until he meets the perky and vivacious, Vickie Dalton at her son’s wedding. There’s just something about her that makes him want to reopen his closed heart. How did her relationship go so wrong? When NICOLE PHILLIPS flees San Francisco after her boyfriend’s jealousy turns violent, she doesn’t know where to go next. Out of a job and a place to live, she heads to the only place she feels safe—her childhood home in the tiny town of Peakview, nestled high in the Colorado Rockies. The one place she’d sworn to never live again. RICK BRADY was a skinny, nerdy kid, earning him the not-so-flattering nickname of Scarecrow in high school. He’d been glad to escape his reputation and leave Peakview behind. When his parents’ health begins to fail, he returns to Peakview and opens his own veterinarian practice on their ranch. He’s never really been in love, unless you count that crush he had on the most popular girl in school from kindergarten through senior year. Now fifteen years after they both left town, they are back home and searching for answers to questions they can’t define. Beneath the beauty of the Colorado summer stars, they reconnect. They soon discover that it’s not easy to leave the past behind. To move forward and find true love, they must overcome their insecurities and doubts and learn to trust again. orty-three year old, Kelly Charm, feels her life slipping away in Prairie, Nebraska. A single mom, she longs for a better life for herself and her teenage son, Ethan. Having scoured online job ads for months, she finally finds an ad for a hardware store manager in picturesque Peakview, Colorado and decides to take a chance. SUZY QUINLAN’S heart dies the day she buries her five year old son, Mason. Leaving the cold cemetery, she flees to the Colorado Mountains searching for peace. Unexpectedly caught in a blinding snowstorm, she seeks shelter in the tiny town of Peakview. JERRY DECKER is known as the town’s hermit. Since returning from his service in Iraq eight years earlier, he lives a solitary life hiding from his demons, with only his dog, Bear, as company. Two hearts damaged by grief drawn together as kindred souls. To move forward, they’ll have to face their pasts and lay their ghosts to rest. Can broken hearts dare to hope again? COME HOME TO PEAKVIEW, COLORADO, WHERE EVERYONE HAS A CHANCE AT LOVE. Twenty-four year old, Mary Meyers, lives to travel. When a rockclimbing accident in Central America forces her home to her parents’ ranch to recuperate, she can’t wait to heal and get backon a plane to her next adventure. The sparks that fly take them both by surprise. They have nothing in common except their fear that falling in love will destroy their dreams. But dreams change . . .
Only five days until Christmas, and FAITH OWENS has had enough. Not willing to spend one more holiday with her abusive, alcoholic husband, she loads her two young daughters, Gracie and Hope, in her car and leaves her life in Scorpion, New Mexico behind. Newly divorced, ZANE WILDER, faces his first Christmas without his son, Ace. He can’t wait for the holiday to be over. To escape sitting home sulking, he travels from Montana to Colorado to spend the week training his young horse, Storm Cloud. When their paths collide at Hearts Haven Bed and Breakfast near scenic Peakview, Colorado, they find more than a place to rest. Two lonely, cautious hearts are brought together by the magic of Christmas, with a little help from Violet Crandall or maybe Santa himself. Will their budding romance continue when the holiday ends? Can two broken families find the missing pieces that lead to happiness? THIS CHRISTMAS, REDISCOVER ROMANCE IN PEAKVIEW, COLORADO WHERE EVERYONE HAS THE CHANCE AT LOVE.